Last week we completed the recap of the demolition on the kitchen and dining room project, and moved the windows around to fit with our new configuration. I this post, we will be starting to rebuild from the ground up! If you recall, we left off with Madeline very curious about just what we were planning to do about this hole! 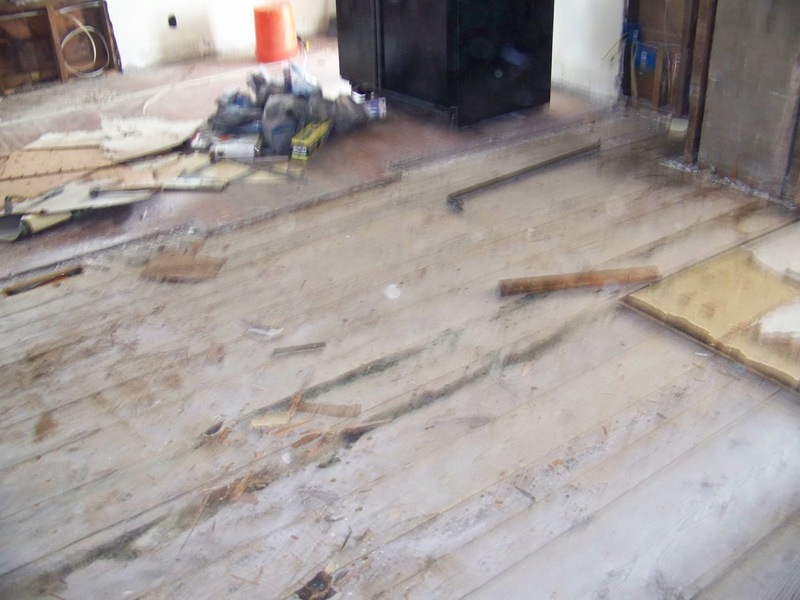 Well, first thing was to tear out the floor down to the subfloor. 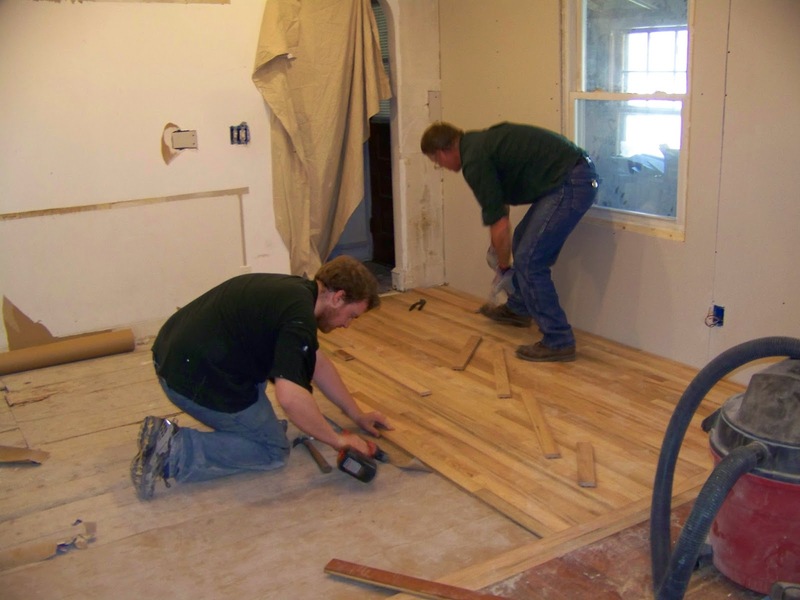 Over time, the kitchen floor had taken a lot of abuse, and we wanted to have a floor which matched the beautiful hardwood from the dining room. 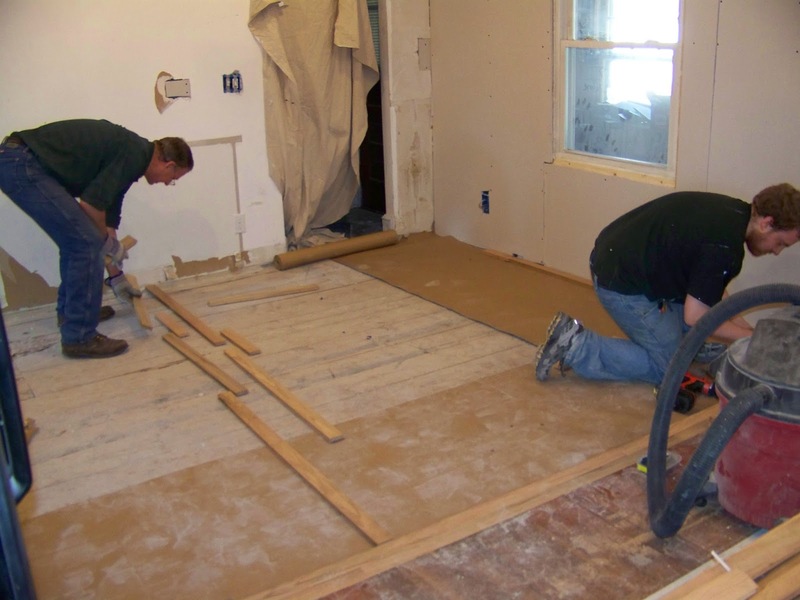 With the subfloor exposed, we were able to repair any weak points, and start with a sturdy foundation as we started to rebuild. My father-in-law was able to help that weekend, and we started to put in a new hardwood floor that would match the old one. First thing we needed to do was deal with a huge seam in the middle of the room. 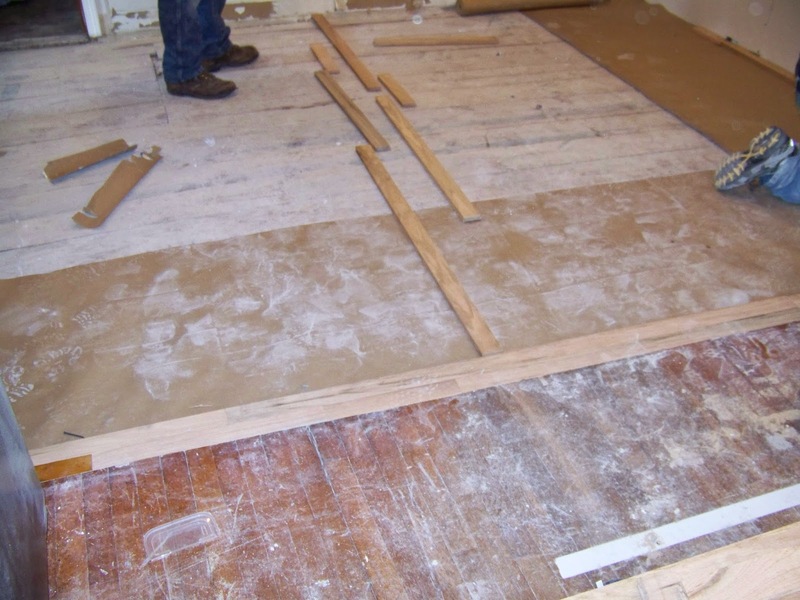 All the floorboards in the dining room ended where the wall was, so our solution was to run a few perpendicular courses to make this look somewhat intentional, and it was easier than trying to feather and weave the new floor into the old one. 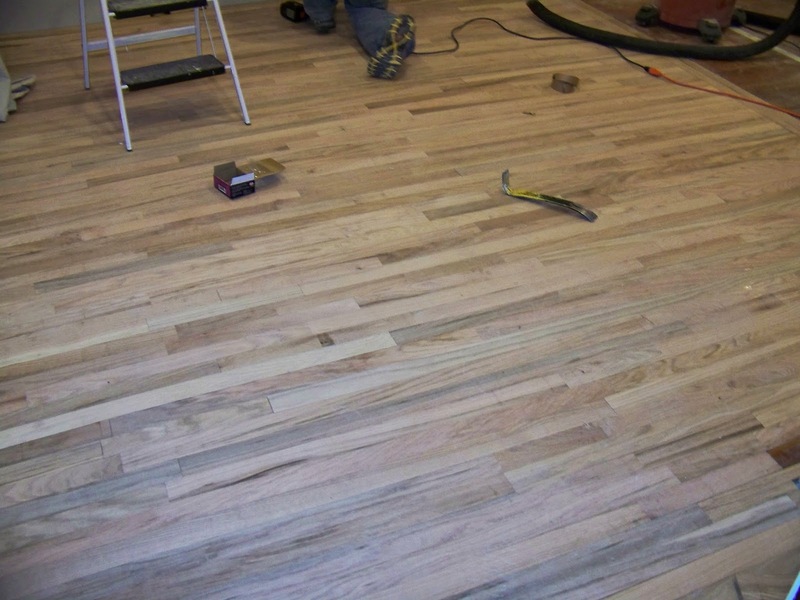 Once that was done, we started working on the rest of the floor. We also sanded down the dining room floor to make sure we would get a good even color to make the new floor look like it was always there. This time we hooked the shop vac right into the sander which really kept the sawdust level down and really reduced the amount of cleanup. Now, the two colors didn't match perfectly, but they were close enough for the stain to make up the difference. 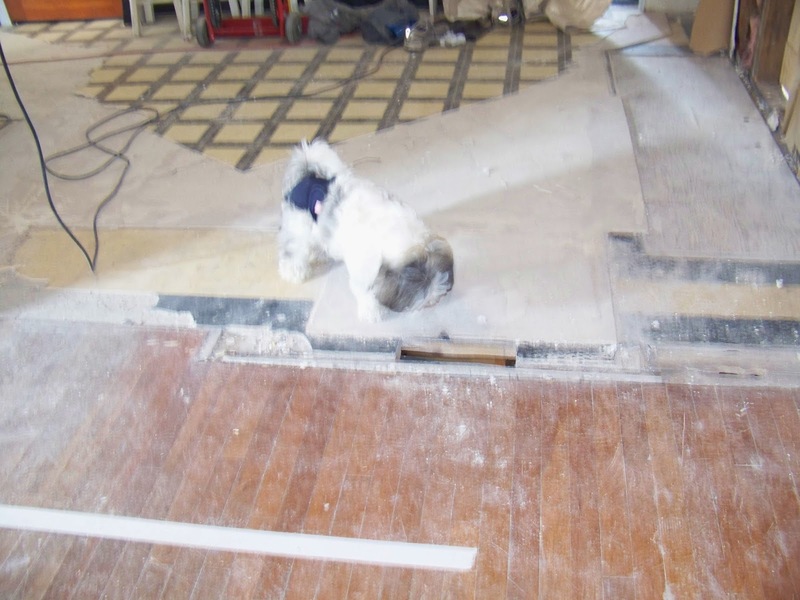 Before the floor prep was complete, I installed the transition between the new kitchen floor and the old living room floor. We also took advantage of the fact that the wall ripped up the ceiling in the middle of the room to feed wires around before we actually finished the floor. 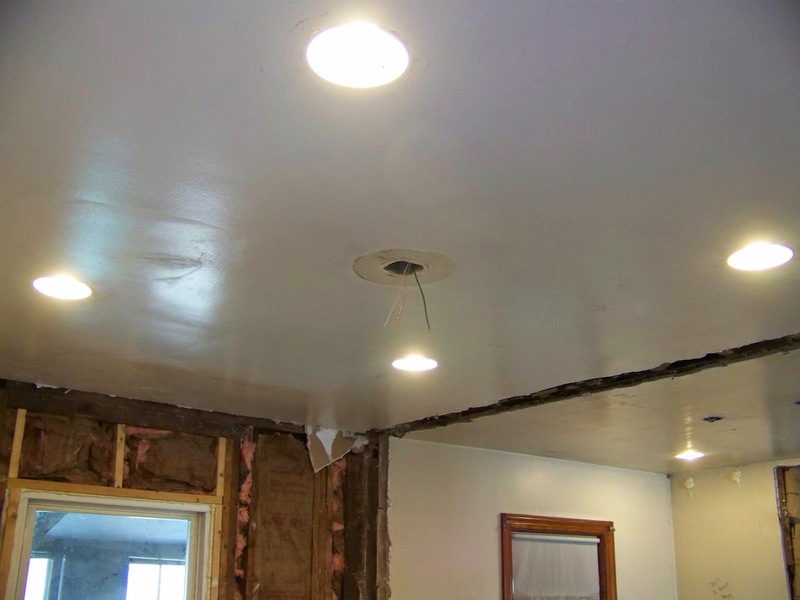 These can lights really lit up the space and kept a higher ceiling clearance but they were a pain because even the ceiling in this house had metal lath and so we went through a few sets of drills before all the holes were made.